I’ve been photographing the natural world around me from youth, and in less of a documentary manner than a personal exploration, as evidenced by this moody (in a teenager sort of way) abstract of roots, done in junior high school with my old 127 Tower camera. I spent a lot of time by myself in the woods, fields, and swamps when young, and have a connection with the look and smell and feel of the Pacific Northwest. I don’t see a beginning or end to this body of work. In the face of current trends I won’t try to defend the continued pursuit of landscape photography. The increasing relevance of the exploration of our connection with everything in life that is not “us” is so blatant the conversation becomes a tiresome obstacle to progression. A lot of landscape photography these days seems to feel the need to be political, have some ironic or clever human element, the odd piece of litter, the badly situated housing development, or whatever. I’m not criticizing that work, but it’s not what I am doing. There’s plenty of that out there, having me join those ranks would be useless and frankly contrived and dishonest on my part. These choices could be considered political anyway, as could anything, but this work is not intended to be simple commentary. Technical information- All of this work is either 120 roll film or 5×7″ sheet film, B&W, drum scanned. There are generally 2 image proportions here, one more square than the other, these are 120 roll film, made with a Plaubel Makina W67 camera. The slightly longer format are all 5×7″, either with my first old Kodak 5×7, or the 1951 Deardorff I still use. 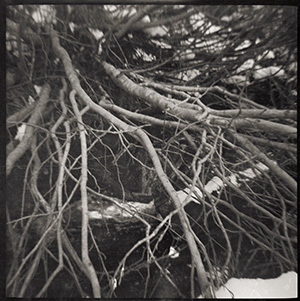 The 2 exceptions are from a trip to Enchantment Lakes in 1980, with an old baby Technika, and are 6x9cm 120 roll film. There have been a variety of lenses over the years, documenting which was used for each image is beyond my patience, though I could probably remember if asked. I”m seriously not an equipment junkie. Films have been FP4, TriX, HP5, and my favorite, TMY, available 5×7 film is becoming and issue. Prints are made for the most part on Hahnemuhle William Turner, sometimes on Hahnemuhle German Etching or Canson Museum Etching. I have been using Jon Cone’s Piezography inks for many years, these all done with a dual quad ink setup. This began with the Piezotone sets, and now evolved into a dual quad set made from the K7 sets. My prints tend to be warm in hue, but there are subtle ways to split or blend the inksets in the RIP software to suit each image best. But they all work together as the blends are made from the same inks, and differences are subtle. I make most in two sizes, ~ 19.75 x 27″, and ~ 14.5 x 19.5″ image size depending on which film format. There may be the odd image I don’t think quite holds up at the larger size, but most do. Some I will do larger for special projects, but not if the quality does not hold up, and the presence loses it’s integrity. At present all ink prints are editioned at 50, either size contributes, they are not separate editions. Many were printed pre- digital on silver, and occasionally platinum, if necessary I can provide that information on a per image basis if needed.